Safety Razor for Men with Double Edge Razor,Blades,Stand Plus Gift Box Ocathnon Safety Razor reduces pressure on the skin perfectly , the Closed Comb design helps eliminate razor burn. No Nicks, no cuts when shaving with it and even for a new beginner skin irritation and ingrown hair. A practical must have a shave tool to help you clean beard and make you more confident. A close shave thanks to a great safety razor shave kit. 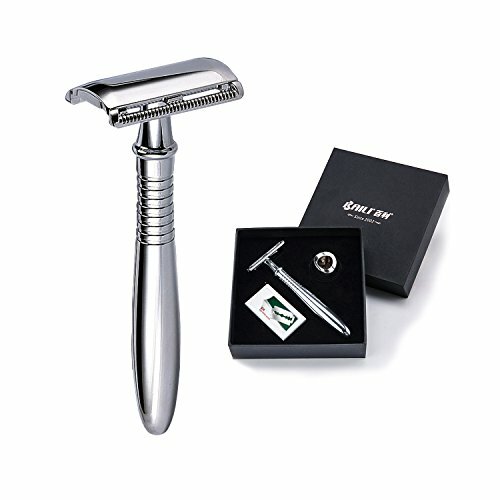 You may need an advanced double edge safety razor plus platinum blades to make job done well. But it’s not enough, you still need pre shave oil & something after shaving for men. Compared with electric shaver, Ocathnon high-end classical razor has a longer life-span as a heirloom to pass down to your next generation proudly, it will be a meaningful gift. Ocathnon Safety Razor comes with fashionable gift packing box, it can be considered as an exquisite gift for your parent, your lover or your friend. A wonderful way to expression of love! What you get: 1xRazor 1xStorage Box of blades 5xHigh Quality Platinum Material Blades Refund or Replacement service Using Instruction: Step 1. Please rotate razor handle with counterclockwise direction and make it separate from upper parts of Razor. Step 2. Please place in between two upper parts of razor. Step 3. Please rotate the razor handle with clockwise direction to install razor perfectly. A mens shaving ritual: (1)Please kindly use shaving beard bubble to soften your beard before using so that weaken friction between blade and beard and shave your beard. (2)Please kindly hold the both sides tightly when you assemble razor and blades to avoid harm your hands (3)Please kindly place the razor on a safety place, keep it away from kids and pets. Don't use blades to shave hair of pets.